Jeff Bangs, Partner at Pathway Group, sits down with Jesse Cnockaert at the Lobby Monitor to talk about our business model and what makes our team stand out. Jeff explains how we play to our strengths, and why Pathway Group is such a great place to work. This article is part of a series called: The Independents. If you have a subscription to The Lobby Monitor, you can read the article here: Or scroll down to view the article. 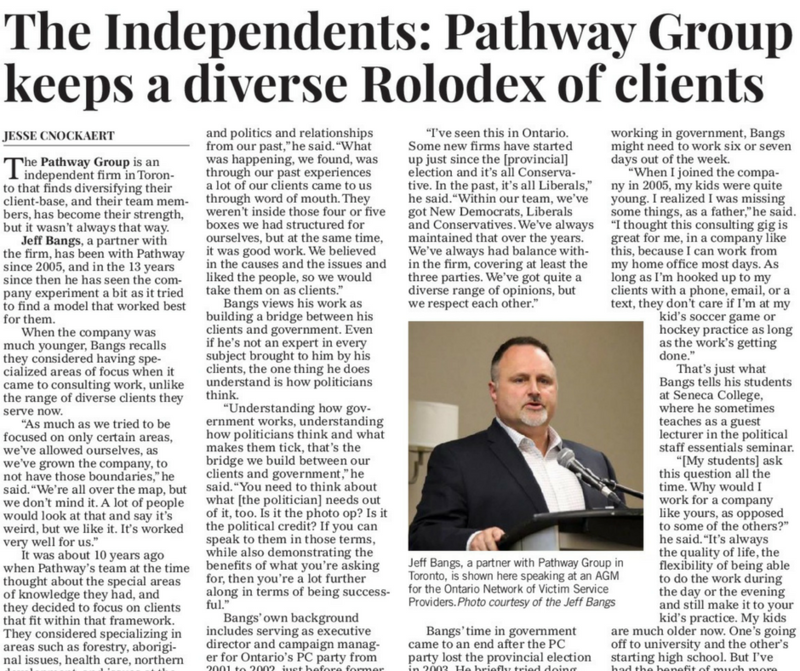 The Pathway Group is an independent firm in Toronto that finds diversifying their client-base, and their team members, has become their strength, but it wasn’t always that way. Jeff Bangs, a partner with the firm, has been with Pathway since 2005, and in the 13 years since then he has seen the company experiment a bit as it tried to find a model that worked best for them. When the company was much younger, Bangs recalls they considered having specialized areas of focus when it came to consulting work, unlike the range of diverse clients they serve now. It was about 10 years ago when Pathway’s team at the time thought about the special areas of knowledge they had, and they decided to focus on clients that fit within that framework. They considered specializing in areas such as forestry, aboriginal issues, health care, northern development, and issues at the municipal level. This didn’t last because of what Bangs calls “the Rolodex of [their] careers.” The common thread among the team members at Pathway is they all have some political background, and the connections they made from those days proved too useful to leave behind. Bangs views his work as building a bridge between his clients and government. Even if he’s not an expert in every subject brought to him by his clients, the one thing he does understand is how politicians think. Bangs’ own background includes serving as executive director and campaign manager for Ontario’s PC party from 2001 to 2002, just before former premier Mike Harris stepped down. Bangs also was principal secretary to former Ontario premier Ernie Eves from 2002 to 2003, and he was chief of staff to Eves when he was minister of finance years earlier. Another way Pathway keeps things diverse is in the political stripes of their staff, according to Bangs, unlike some firms that try to have staff members who match up with which party is leading Ontario. Bangs’ time in government came to an end after the PC party lost the provincial election in 2003. He briefly tried doing independent work until he found the team at Pathway, where he discovered his background in government could be a marketable commodity. He then surprised himself by how long he’s stuck around. “I never thought I would be [at Pathway] as long as I have been. I thought I would give it four or five years,” he said. A big part of the appeal for Bangs at the time was the flexible working hours. When he was working in government, Bangs might need to work six or seven days out of the week. That’s just what Bangs tells his students at Seneca College, where he sometimes teaches as a guest lecturer in the political staff essentials seminar. 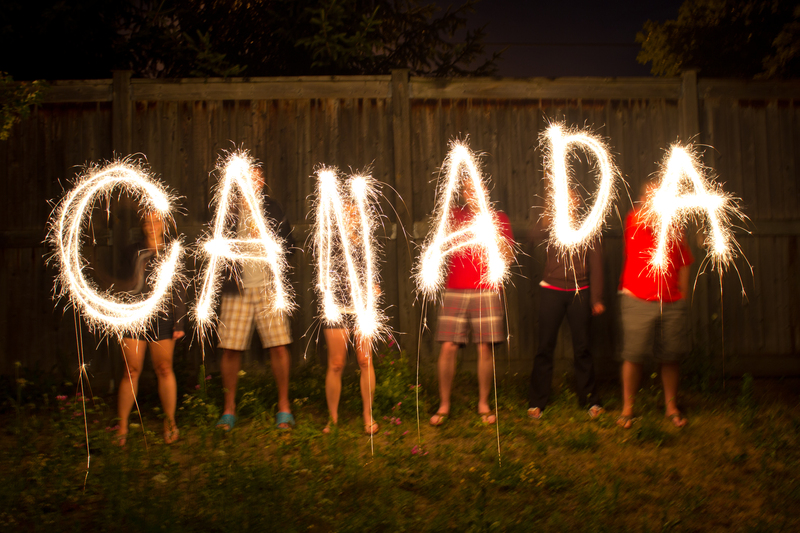 Find out where to celebrate Canada150 in your community!